LightWave 3D® enters the Real-Time Age for interchange with this workflow link between the Unreal Engine and LightWave 3D®, focusing on LightWave driving Unreal changes iteratively. Multiple LightWave seats are able to connect to the same Unreal Editor simultaneously to enable real-time collaboration between artists. The bridge uses NewTek’s proven NDI® network discovery mechanism for easy automatic configuration, and can be limited to single project use in Unreal, or installed as a general plugin for use in all Unreal projects. – Work with industry standard FBX data on a whole new level via the new Interchange Bridge. – Interactively choose what to import / export and how. – Add to existing FBX files from Layout and Modeler. 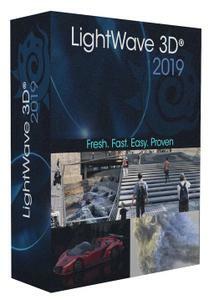 – Build LightWave 3D® assets from many FBX files. – Easily revisit FBX files via workspaces. – Metamorphic is a multipurpose animatable mesh sculpting and vertex map manipulation plug-in for LightWave 3D® 2019 that works in Layout, and takes full advantage of the new capabilities of the modifier stack.